27 | April | 2006 | Kris Johnson's Blog…sort of. Apart from the occasional Ultimate Spider-Man trade paperback, I don’t pay too much attention to Spider-Man comics these days. I know there was some “Spider-clone” hubbub a few years back, but I had long since stopped buying the comics, so I didn’t get excited about it. This morning, co-worker Chuck (AKA gator) tossed a copy of The Amazing Spider-Man #531 onto my desk. The first thing to catch my eye was Captain America sitting next to two other guys on a couch, apparently watching a little teevee. The guy on the other end of the couch looked an awful lot like Tony “Iron Man” Stark, but who the hell was the evil Iron Fist wannabe munching popcorn in the middle? 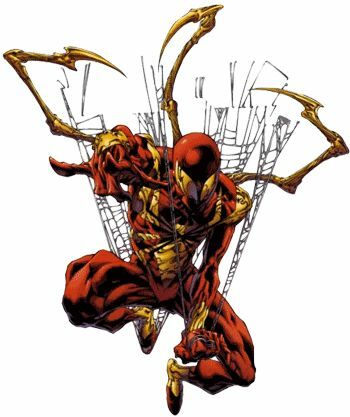 Well, that’d be Spider-Man, in his new “Iron Spidey” costume. Seems Tony Stark is now Spider-Man’s “boss” and he gave the webslinger a new, upgraded costume. The new duds are red and gold, which makes for some nice color coordination with Iron Man’s armor (can you say “branding”? ), and it was built by Tony Stark, so it’s got all sorts of gadgets and gizmos built in. You know, a nice Heads-Up Display, on-board computer, glider wings, and stabby arms that shoot out of the back. Wait a minute. Stabby arms? Yep. Think Doctor Octopus, only… well, stabbier. I counted three golden, multi-jointed arms jutting out of a golden circle on the back of the costume, stabbing Titanium Man right in the face. Now, granted, Titanium Man was kinda asking for it, and he is wearing a full-face, armored helmet, but the whole stabby arms business just doesn’t seem like Spider-Man to me. For that matter, neither do the on-board computer and HUD. Spidey has always relied on his radioactive-arachnid-given abilities and sharp wit to get by; using technological gizmos — with the exception of the web-shooters he designed — has always been a last resort. For a fine example of this (not to mention an example of Spidey’s bad luck with new costumes), see the alien costume saga, in which Spidey ultimately turns to Mister Fantastic and a sonic cannon to help him fight the symbiote. New costume or old, I don’t plan on reading any more issues of The Amazing Spider-Man any time soon, and as long as Joe Quesada (Editor in Chief of Marvel Comics and apparently the brains behind the new costume) doesn’t mess with Ultimate Spider-Man or (even worse) the Spider-Man movies, I’m okay. But damn, that’s an ugly costume.